Carole Middleton has managed to create another controversy with her Party Pieces business. This time around many critics are calling the company’s Zombie Princess Halloween outfit as a costume in poor taste. 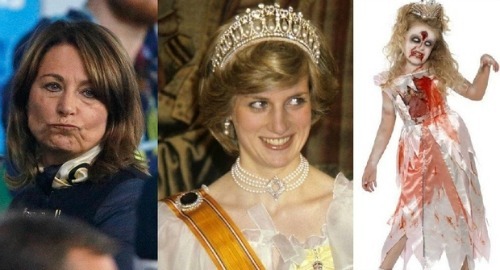 As a matter of fact, Carole is reportedly getting a lot of backlash from Princess Diana’s friends and the public as no one seems to be a fan of the costume. The Zombie Princess Halloween outfit depicts a bruised and bloodied sleeping zombie dressed in a princess costume. It features an exposed rib cage and organs and can be purchased for girls as young as four. Considering how Kate Middleton’s own mother-in-law Princess Diana died in a horrific car crash back in 1997, a lot of critics can’t understand why Carole and her husband Michael Middleton would think that showcasing a bloodied princess on their website would be a good idea. If that weren’t enough, royal writer and commenter Ingrid Seward also said that the outfit was in very poor taste, too. But then again, this isn’t the first time that Carole Middleton has used has provoked the media and the public by referencing the royal family with her Party Pieces business. Earlier this year the company had a Meghan Markle-look-alike model in their line of royal wedding décor right before Meghan’s wedding to Prince Harry. The week of their royal wedding, Party Pieces sold everything from Union Jack head boppers to British bowler hats. Back in 2016, it was also reported that Carole used her column in the Little London magazine to shamelessly promote the business with her tips on how to throw and outdoor children’s party. Party Pieces even has a royal-themed paraphernalia line that includes wigs for queens and princess along with inflatable crowns. So far Carole Middleton herself has not made any comments about the controversy or whether or not she would pull the Zombie Princess Halloween costume from her Party Pieces website. At this point, it’s doubtful that the Middletons will say anything at all, as the controversial costume is still available on their website. In the meantime, don’t forget to check back with CDL for all the latest news and updates on Kate Middleton, Carole Middleton and the entire royal family right here.